Gain a systemic approach to dental medical screenings. A systemic approach to evaluating overlapping disorders, such as airway and occlusion problems not only ensures that your results are accurate but saves time during the examination process. 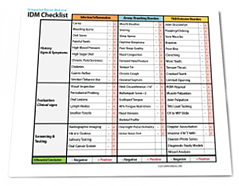 With The Integrative Dental Medicine Checklist, you take control of overlapping disorders by evaluating your patients' history of symptoms, evaluation of clinical signs and of course, screening and testing. Download your free copy of the The Integrative Dental Medicine Checklist today by filling out the form to the right.